France based smartphone maker Alcatel has launched a new Android 4G tablet in India, dubbed as the Alcatel A3 10. The company had launched the 4G Android tablet back in June last year with 2GB RAM and 16GB of internal storage. Now, Alcatel has launched the 3GB RAM and 32GB internal storage variant of the tablet in India. The 2GB RAM variant was launched at Rs. 9,999 and the 3GB RAM variant has been launched at Rs. 11,999. The Alcatel A3 10 4G Android tablet runs on Android 7.0 Nougat. It features a 10.1 inch multi-touch display with a resolution of 1280 x 800 pixels. It comes with a pixel density of ~150 PPI. 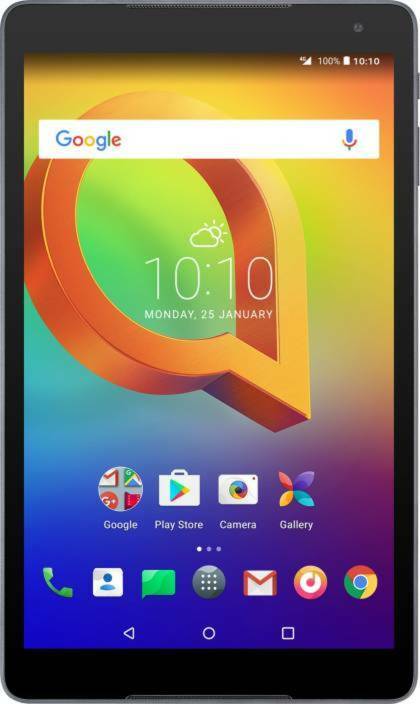 The Alcatel A3 10 4G Android tablet is powered by a quad core MediaTek MT8735B processor coupled with 3GB of RAM and 32GB of internal storage. The internal storage on the tablet can be further expanded up to 128GB via a microSD card slot. Coming to the camera department, the Alcatel A3 10 4G Android tablet features an 8MP primary camera. On the front, the device sports a 5MP secondary camera for selfies and video calling. The Alcatel A3 10 4G tablet is powered by a 4,600mAh battery. Connectivity options on the device include 4G LTE, WiFi b/g/n, Bluetooth 4.2, GPS, USB port, 3,5mm audio jack and dual speakers. The tablet measures 260 x 155 x 8.95 mm and weighs 465 grams. The Alcatel A3 10 4G Android Tablet has been priced at Rs. 11,999 and is available in Volcano Black color option from Flipkart.